As I write this article I am in Eureka, NV exploring this old historical ghost town. Eureka is off the HWY 50 which is known as the loneliest road in America. It took myself and my co-pilot, Mayela, 11 hours to get to this old silver mining town. I was asked to be a guest speaker at a paracon event held out in this town. This small town has a few haunted historical buildings that I got to investigate, the first night I actually got to spend the night in one of the haunted locations. The old Eureka Cafe is joined by an old saloon with some old hotel rooms/apartments above; that's where we got to sleep that first night. Before going to bed though our host of the event showed us around the building, including the tunnel that's underneath. Of course, we decided we wanted to investigate that night and we hung out in the cafe to see if we could make contact with Ann or Peter who are previous owners that apparently want to stay around. We took mainly just a recorder with us since it was late and we had a long drive, we didn't feel like unpacking any equipment. I always introduce myself and give them permission to interact with me by appearing to me, talking to me, or even touching me; well whomever I was interacting with in the cafe liked to touch me, that first night I was touched twice and the second night we went back I was touched 2 more times. The second night we also had equipment going off and Mayela saw a shadow while I could have sworn I saw a person that wasn't there. The following day I did my guest speaking bit and that night we did an investigation at what is known as the opera house. While backstage, 3 times I could have sworn someone was either beside me or behind me but as soon as I shined my light I saw no one. We went down to the basement where Mormon Joe is known to be and I know without a doubt I saw his shadow in the basement and Mayela had saw a shadow leave the room. We then moved onto the Owl Club, where we only stayed an hour due to being so tired; but I will admit in the basement I kept feeling like someone was standing behind me when no one was there. We are still actually here as I write this and have the Jackson hotel to explore tonight and then when we get home all the evidence to go through, so we can't say what we have evidence wise but we can say we have had many personal experiences. So to say the least, we have not been disappointed with the Haunts here in Eureka. This small little town off of the loneliest road in America may not be filled with a ton of entertainment, but in my opinion, it is differently filled with the spirits of the town's past. The residents of the town are very friendly and welcoming, and we met some wonderful people that I have already formed friendships with. 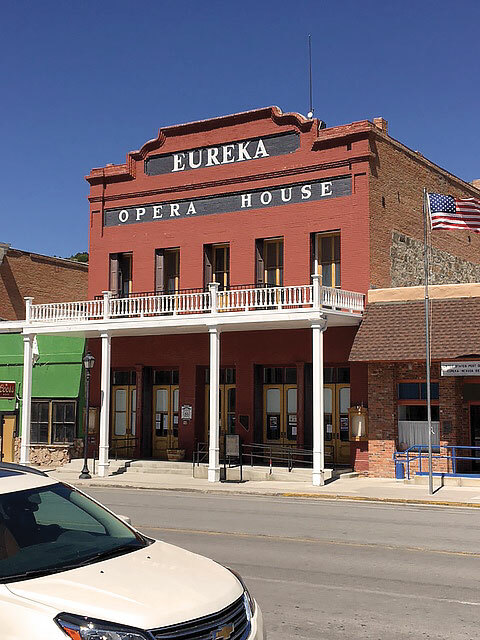 So if you ever feel like escaping city life and going to a true ghost town with Haunts; look up Eureka, NV and have some personal experiences of your own. Until you do that though, remember you are truly never alone!